A somewhat strange day. Apocalyptic weather forecasts led to most of Bergen shutting down at lunchtime; my day’s work at Høgskolen i Bergen was truncated as a result, and it was at the point of termination that I took this picture, which doesn’t quite capture how foul it was here, though I like the greyness of it (I knocked down the saturation a bit, but only a bit). Shortly after this KLM then cancelled my flight home, which explains why I’m still here and won’t be home until tomorrow night, 24 hours after originally scheduled. Yet in the end the afternoon’s weather in the city, while poor, was certainly no worse than it often can be here. I originally got quite angry about this, feeling that everyone could have done with a little less panic. However, it seems that the coastal mountains may have protected the city somewhat. Apparently areas futher north today had the strongest winds ever recorded in Norway. But hey, I’m still allowed to be pissed off that I didn’t make it home (quite a few flights happily left Flesland airport), particularly on a Friday night. So another day in Norway tomorrow, then. So be it. It’s a bar. It’s also a record store. It’s…. it’s…. well, what more do you want? Or need?? The Seafarers’ Monument sits in one of the main squares of Bergen. It’s not the most beautiful of monuments, but maybe that’s why someone decided, presumably before Christmas, to prettify it. Much as I like many things about Bergen, it is the rainiest city in Europe. This picture was taken in the foyer of the university library this lunchtime. It rained all day, which explains why there are no photos of this morning’s eclipse despite Bergen experiencing 98% totality at about 10.50am. It did get very dim, but not a hint of sun (obscured or otherwise) was to be seen. Ah well, never mind — I have bagged an eclipse before. Maybe next time. 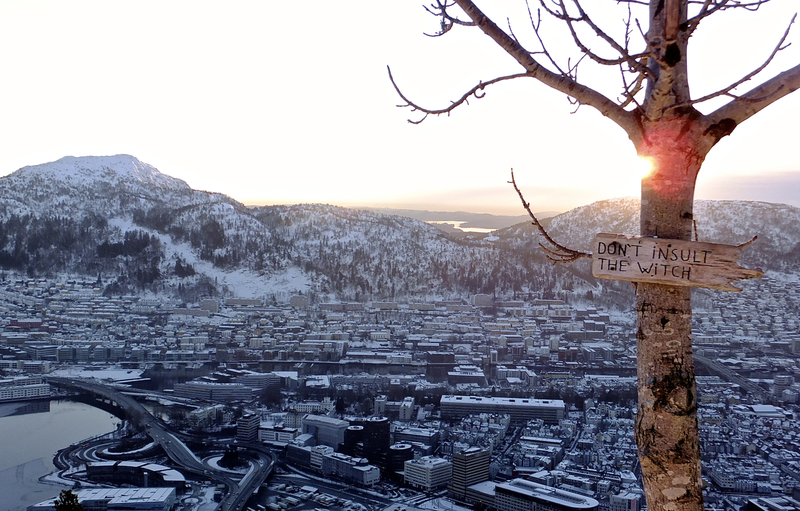 If in doubt for something to do in Bergen (and you’ve finished work for the day), take the funicular and come up here. This is Fløyfellet’s second appearance on the blog, the first being well over three years ago (27th Nov 2011), and the second shot in a row of a snowy Norwegian scene with a vaguely supernatural element. As pictured from the final descent into Bergen Flesland airport this afternoon. Tell me I’m not the only person who sees this. I’m just waiting for the moment at which it snaps its jaws open and consumes the yacht without a trace.I have looked for this island (or peninsula, or archipelago) on a map of the area but can’t identify it; perhaps it only reveals its monstrous nature from this very specific angle. 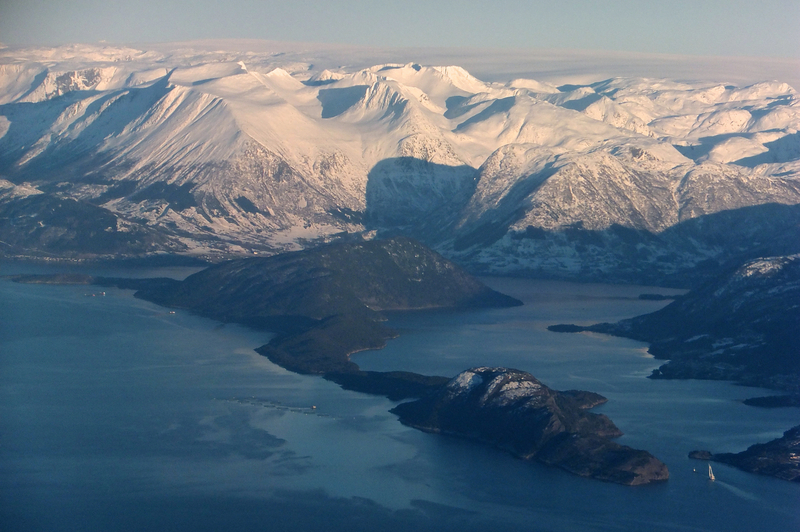 Postscript: As the comment indicates one of my followers has since identified this as the island of Snilstveitøy. The Flybussen links Bergen city centre with the airport and I’ve become quite familiar with it over the years. Home from Norway this evening, the last trip abroad of 2014. Not a bad shot although it might be nicer if the emergency window-smashing hammer weren’t hovering over things like the sword of Damocles. Fagernes Yacht Klubb is the name of this band. They play a series of hoary old 70s and 80s classics, and do so very well, despite the fact that none of them could possibly have been born before 1990. They were the climax (at least for me) of the evening’s entertainment at Høgskolen i Bergen’s opening celebrations (see also yesterday). Høgskolen i Bergen has spent all week celebrating the opening of its new campus. Today the library was officially opened, with, among other things, talks and seminars (including one by yours truly) and then the rather more interesting spectacle of tango dancers among the bookshelves. The lighting was not really suitable to get one of them in motion (although perhaps I am more apologising for my deficiencies as a photographer) but I like this one of three of them just before they got going. There may well be another picture of the evening tomorrow as I got some decent ones of the band after midnight, but let’s see if the journey home gives rise to any decent candidates, before I decide.